An estimated 420,000 people die due to food poisoning every year. Food poisoning is the result of consuming contaminated food. The contamination can happen at any stage of food production right from raw materials to the final plating of a dish. Some of the most common symptoms of food poisoning involves diarrhea, loss of appetite, nausea, vomiting, stomach pain and cramps, chills, weakness among others. Food poisoning can happen due to contaminated food article or via impure water that is used in cooking. Food items consumed from open stalls and push carts are also highly unhygienic and may often make one fall prey to food poisoning. Monsoon is the time when the propensity of deadly bacteria and viruses to multiply grows stronger. Food-borne diseases therefore see quite a spike during the rainy season. Some of the commonly identified culprits of food poisoning include Salmonella, E. Coli among other parasites. Uncooked meat, raw eggs and even dairy stand a chance to have fatal viruses accompanying them. The best way to manage food poisoning is to get proper medication, have plenty of natural and hygienic fluids and consume a bland, light diet. Green leafy vegetables, sprouts, raw eggs, seafood and meat, and even raw juices may carry harmful agents that can lead to food poisoning. "Opt for packaged milk and cook eggs properly. Avoid half fried eggs if you are not sure of their quality or source. To inhibit the growth of bacteria on your veggies and fruits you can wash them in salt water or potassium permanganate," noted Dr. Ritika Samaddar from Max Healthcare Saket, Delhi. While food poisoning can get quite an irritating and taxing affair, you can try some easy home remedies to get some relief. Some of the most easily available ingredients can come together to soothe your tummy trouble. Two tablespoons of ACV can be mixed in hot water and had just before your meals. It will soothe your gut and get rid of the harmful parasites. 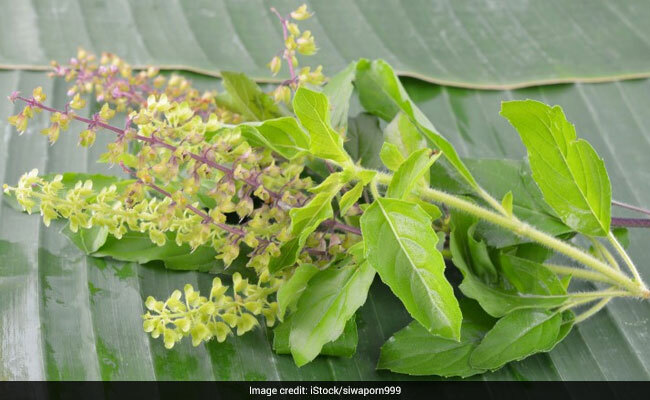 The holy basil seems to be the cure of almost every common ailment that plagues human health. Its anti-inflammatory, antibacterial properties makes it a perfect fit to tame food poisoning. Pure basil juice can be mixed with some honey and had to feel relieved. You can also add few drops of basil oil in your regular drinking water and keep sipping on it throughout the day. These both are a powerhouse of gut-benefiting properties and come loaded with antibacterial properties. Simply add these in your regular meals or try having the juice if your palate permits.